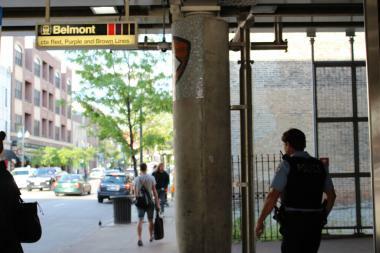 A cop walks past the Belmont "L" stop. The area around the train station is known to attract crime, police have said. LAKEVIEW — Even though crime numbers have dipped since February, Lakeview residents said they felt that fighting, drug use and loitering has invaded their neighborhood due to organizations that cater to young people who take advantage of social services. At a community policing meeting this week, about a dozen residents blamed services like The Night Ministry, Center on Halsted and Broadway Youth Center for attracting unsavory activity to their neighborhoods. They demanded that the nonprofits be held accountable for their clients after they leave the centers. The charges reignited a debate that fired up the community two years ago. "Who is responsible?" said resident Michael Smith. "Who is controlling them? Are [youths] out on their own like 'Apocalypse Now'?" Crimes such as robberies and batteries in Lakeview have increased in the past two years, and a violent summer in 2011 ignited tensions between those offering youth services and other members of the community. And January saw a spike in robberies, with a nearly five-fold increase from the year before. But since February, robberies have dipped 13 percent, which area police credit to an increase in stops of suspicious persons, aggressive education efforts and the implementation of a dedicated police force in entertainment districts. "This is a NIMBY [Not In My Backyard] issue," Ald. Tom Tunney (44th) said at a CAPS meeting earlier this year in reference to The Night Ministry's youth homeless shelter, The Crib. "It's an issue of perception of safety." Residents have been meeting with The Night Ministry, police and representatives from Tunney's office to discuss the shelter, located at the Lakeview Lutheran Church, 835 W. Addison St., to tackle issues like noise and fights. It's the first year the shelter is offering year-round service. Since a meeting in February, complaints about the service organizations have died down, said Erin Duffy, the ward's community relations director. But they've risen again as the weather warms, and the group plans to meet again next week in hopes of continuing a dialogue, she said. Barbara Bolsen, who runs The Crib, said she plans to meet with neighbors regularly and emphasizes that the program will only succeed if it fits in the neighborhood and receives feedback from residents. The Crib has rules for its residents that cover actions both inside and outside of the 20-bed shelter. Violators are disciplined, she said. She said all local crimes are not necessarily being committed by the youths who visit for services, Bolsen said. "It’s a little simplistic to just blame it on young folks," she said. David Dodd, spokesman for the Howard Brown Health Center, the parent organization to Broadway Youth Center, said that their clients are not the ones committing crimes. And the Center on Halsted aims to keep the property as safe as possible by kicking out violent people and patrolling the area, said spokesman Tom Elliott. "I don't think it's fair to blame an organization for a really broad claim that violence or crime has gone up," he said. "If people feel threatened, they should call the police." Officer Kelly Sims, representing the community policing office, also said neighbors should not be afraid to call 911 if they spot disturbances. Even if a crime is not committed, police can write up a "contact card," which puts people on their radar without an arrest. Police in the Town Hall Police District have collected 43 percent more contact cards this year than the year before. Lake View Citizens' Council members Susan Hagan and Graham Warning said they would ask the board to hold a session where a wider group of neighbors could discuss crime issues related to youth services, and indicated that crime in the neighborhood is a more widespread problem to be tackled. "It is a jungle out there," said resident Ron Woods. "It's a madhouse. It's anarchy."